The houses are being rendered in shades of cream, blue, pink and green, in keeping with the fact that, throughout history, colour has been incorporated architecturally to boost public morale and improve the impact of development on the surrounding landscape. Mike Jones, Morgan Construction Ltd Site Manager, highlighted the ‘availability and excellent customer service from both supplier and manufacturer’ as key aspects to the first 12 homes of the project being delivered ahead of schedule in November 2018. Adrian Vaughan, Jewson Fishguard Branch Manager, agreed, saying regular communication between his branch and Renderplas meant tight delivery deadlines were consistently achieved. “This is a complex development to supply; the different building phases require specific colour beads and render at precise times. Renderplas offer a next day delivery service direct to site which has been invaluable on this project,” he said. Airless Plastering Wales Ltd, the rendering sub-contractor on site, are a company with 15 staff specialising in rendering and liquid screeding. Co-owners Luke Jamieson and Richard Medlin, who have more than 20 years’ experience managing such projects, spoke about their highlight of the work. “For us, working with the Renderplas PVC beads has been the best part of the project. The beads are strong and less flexible than cheaper alternatives making them easier and quicker to install. 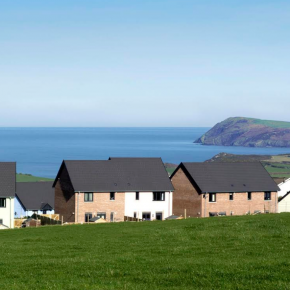 Parc y Cefn is a development of 30 houses and bungalows, situated in an idyllic coastal location overlooking Fishguard Bay. 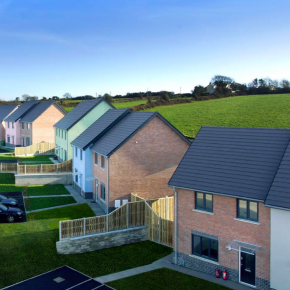 The coloured renders have been chosen to reflect the surrounding natural landscape; Azure Blue represents the sea and sky, Sage Green the hillsides, Rose the beautiful West Wales sunsets and Cream the clouds. Renderplas have a permanent supply of all nine colours in stock in a wide variety of profiles, ready to be dispatched on a next day delivery service. As well as the colours used on the Parc y Cefn project, which reflect the rural and coastal landscapes, the company also stock the earthy colours of wheat and terracotta and the more urban tones of white, dove grey and slate grey.